I’m not sure how other writers feel, but I have an easier time writing a novel set in a particular season when the weather outside reflects that time of year. It’s far simpler to channel the surroundings by immersing myself in the sights, sounds, and scents that make each season unique. Oddly, I wrote most of MYTH AND MAGIC, my new romantic suspense/mystery novel—which is set in October and features a strong Halloween theme—last summer. I guess it’s only appropriate that it release now when I’m slathering myself with sunscreen before dipping into my backyard pool. Even then, however, I can appreciate rumors of ghostly happenings, a secluded corporate retreat with an infamous past, and a tension-filled Halloween party. These are just a few of the things creating issues for my hero—a P.I. who returns to his hometown to investigate strange happenings at a lodge his family owns. Unfortunately, he’s been estranged from his family for twelve years, and the lodge is managed by the only woman he ever loved. Veronica suppressed a chill. The familiar creaks and groans of the old lodge had stopped, replaced by unnatural stillness. She felt trapped, confined behind her desk, a target for a faceless assailant lurking outside. The hair prickled on the nape of her neck, sending a string of goose bumps down her arms. Crossing to the door, she held her breath then paused on the threshold, listening for telltale signs of intrusion. Some creep’s playing a game. He probably saw Kelly’s article and thought it would be fun to scare me. Before the incident with the dog, Stone Willow’s cook, had sworn she’d seen the ghost of Warren Barrister standing on the basement stairs. Veronica had heard eerie sobbing during a routine check of the vacant third floor two days earlier. Whether the occurrences were supernatural or contrived, they were mounting and unquestionably spooky. Forcing herself to stay calm, she crept down the hallway, her tread light by nature. As a child, Merlin had compared her to a fairy queen, saying she looked the part with honey-kissed hair and green eyes. They’d been enraptured by myth and magic in those days, unaware there were real monsters in the world. Monsters like the men who’d murdered Trask and destroyed Caith’s life. Shaking the memories aside, she stepped into the lobby. All looked as it should be. The back of the check-in desk was visible, webbed in patches of velvety shadow. Towering glass windows hugged a cathedral ceiling, crisscrossed by thick wooden beams. I left something in the fireplace, the caller had said. Veronica hugged the collar of her bulky green sweater closer and padded across the waxed floor toward the stone hearth. She was still several feet away when her mind processed the sight. A charred, cracked lump, broken by knobby protrusions of white, burned on top of the stacked logs. Something popped with the sound of cooking meat. Choking on terror, she stumbled backward with a scream. A severed human hand was swaddled within the dancing flames. 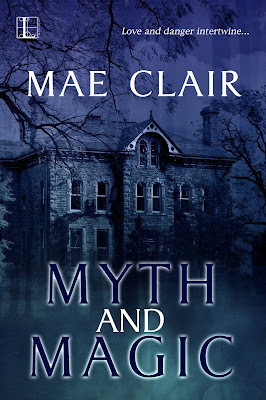 I love all Mae Clair's books but in Myth and Magic she has outdone herself. Bravo, Mae! Best of luck with this release! I am already drooling for the following ones. When I'm writing something kind of spooky or Halloweenish in the "wrong" season, I put on some sound effects on my computer, like thunder or wind. It sets the mood. Lauralynn, I'm delighted to hear you're enjoying the story. And what a great idea about using sound effects on your computer for something Halloweenish or spooky. I love that idea and am going to have to give it a try! Waving to Mae! A quick drive by to say hi and welcome to one of my favorite sites. Hi, Stanalei. Thanks for dropping in. And I'm with you...I love JRS. I'm always finding new reads here! I know what you mean. Because of deadlines, I'm usually writing in a season opposite to the time in the book and the time it is published. Maybe that helps me keep cool in summer and warm in winter though! You chose a great excerpt to highlight your wonderful book. 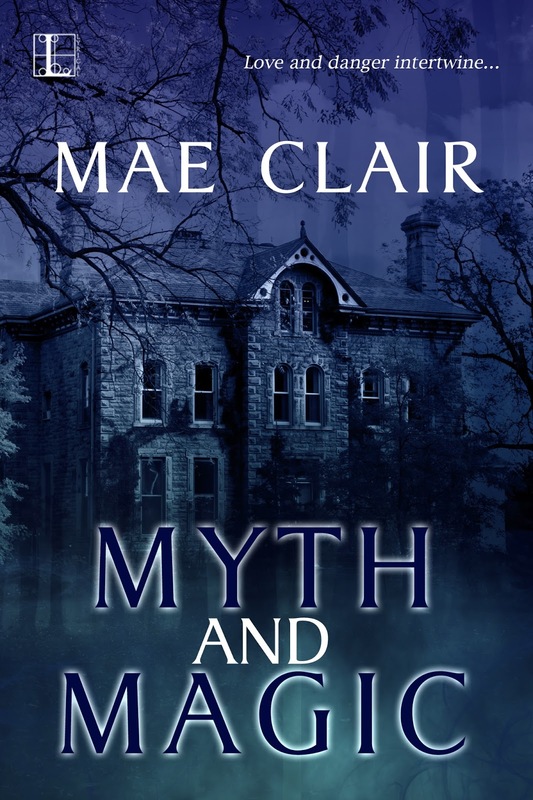 It's always the right season for Halloween and for a Mae Clair book! And you're right about deadlines, seasons and publishing time. It is kind of fun to have those seasons all year long when we can simply immerse ourselves in writing a novel. Writers have the edge there, LOL!